Today, the NAO has produced a report looking into major projects. Their conclusion, that a third of them could fail in the next three years is scathing. 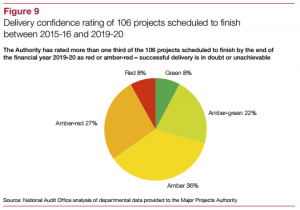 Obviously, the report based on the work of the Major Projects Authority (now the Infrastructure and Projects Authority) doesn’t say which projects are rated red or amber-red as the Governments ‘Transparency Agenda’ won’t allow that to become public this soon, but given that HS2 has regularly been rated ‘amber-red’, there’s no prizes for guessing that it’s one of those where “Successful delivery was in doubt or unachievable unless urgent action is taken”. Whilst the NAO report relates to the MPA reports from June 2015, further ones will have taken place in November, but the Government still refuses to publish details of the reports from the November 2014 report. Whilst the Information Commissioner ordered publication of this report, which HS2 Ltd Chair Sir David Higgins admitted had raised 75 ‘complex issues’, the Government have fought publication, and a first tier tribunal is now set for April, whilst the refused request for the June 2015 report is currently with the Information Commissioner.